The Division 2 Liberty pistol is one of the best Division 2 Exotics in the game. It's only a sidearm so it may not seem as useful, but the Division 2 Liberty talents make it highly sought after. You need to find a number of Division 2 Liberty parts to craft it though - including the blueprint - and they're not easy to obtain. 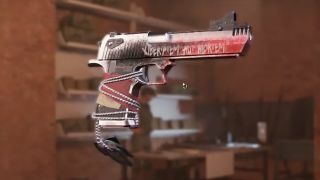 You need to complete a number of The Division 2 missions on tough difficulties, so read on to know everything there is about the Division 2 Liberty Desert Eagle Exotic pistol. Liberty: Gain +100% damage to hostile electronics. While aiming, enemy weak points and hostile electronics are highlighted. Blind Justice: After destroying an enemy's weak point or hostile electronics, your next bullet deals +500% weapon damage. If that shot kills an enemy, your magazine is refilled and grants +100% weapon damage for the entire magazine. Independence: While holstered, destroying weak points refills 20% of your current weapon's magazine. These three talents make the Liberty incredible at taking down enemy electronics like drones and robots, which the Black Tusk seem to have an endless supply of. You can clear out numerous enemies if you take down an incoming drone first, then click on a few enemy heads. If you want to get the the Division 2 Liberty exotic pistol, here's everything you need and how to get it. Obtaining the Liberty in The Division 2 isn't easy. Firstly, you need to keep your eyes out for the base weapon, which is a level one High-end D50. This is a completely random drop so while you're playing through the endgame and grinding for the other parts to Kendra's Liberty, make sure you look out for a D50. One speculated place to receive it is at the end of the invaded Potomac Event Center mission. Aside from the base weapon, the first part of the Liberty Exotic Pistol you'll receive is actually during the story. Killing Kendra Nelson at the end of the Capitol Building level 30 stronghold will drop the Pistol: Trigger & Mechanism component, so if you haven't reached that part of the main story yet, play through till then. Now there's three more parts you have to get that you won't stumble upon automatically. First up is the Pistol: Receiver & Paint Job, which drops from Captain Briggs at the end of the American History Museum in East Mall on Hard difficulty. Complete that and kill Captain Briggs, then move on to the next part. Staff Sergeant Carl Wade will drop the Pistol: Sight & Rail at the end of the Viewpoint Museum mission on Hard, which can be found in Federal Triangle. Finally, Master Sergeant Steve "Junior" Quiroz will drop the Pistol: Grip & Tags, along with the Kendra's Liberty Blueprint. He can be found at the end of the Space Administration HQ in Southwest. Again, you have to beat it on Hard difficulty. When you've obtained a level one High-end D50 pistol, all four specific components and the Kendra's Liberty Blueprint, you'll be able to craft the Liberty Exotic Pistol as long as you've upgraded your crafting bench completely too. With your big iron on your hip, why not try and get all of the Division 2 Ivory Keys?